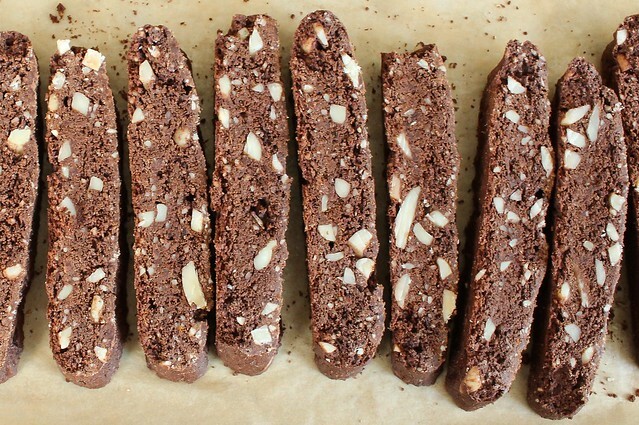 (Gluten Free) Biscotti as Exercise. Why does nothing warm me up faster (and better) than turning on the oven? If this winter is good for anything, I’d bet it’s good for the collective weight gain of all of those who agree with me. I shiver at the steady stream of carbohydrate intake for my picky kid, and yet I’m doing my fair share to keep him in steady supply. Maybe I can’t help it; the very definition of comfort food is entwined with carbs. On these cold mornings, the ones that you almost have to laugh at, I need something with the coffee. Oh, I’ve had my reasonably healthful breakfast, but later in the morning when the deep black joe hits the cup, it’s begging to have the company of something sweet as well. Maybe I comply under the guise of warming the kitchen, but really, it’s just nice to have a little something to nibble. A little second breakfast of homey, comforting carbs to chase the caffeine. It can also be argued that the kitchen work itself is althetic too. Ample amounts of hand dishwashing, that elegant dance of opening and closing cupboard doors and drawers: in my mind this qualifies as exercise. And have you ever rolled out laminated croissant dough by hand? I swear this itself is key to a well toned midsection. When I'm cooped up in an endless winter, unable to take my usual walks, I take this revitalization instead. And I add a few new sweet tidbits to my unending mental pastry library. Of the many sweets that I find impossible to stay away from, I actually show impressive restraint with biscotti. Unlike more traditional cookies, I can eat only one and be satisfied. I can look forward to a single, crunchy brick every morning and feel secure in their preservationist ways since a batch of biscotti can last well on a month in an airtight glass container. I got it in my head to try a gluten-free one the other day, maybe because my Mom is coming to visit next week and she tries not to overdo in gluten, but probably also because I really like trying out new gluten-free recipes. 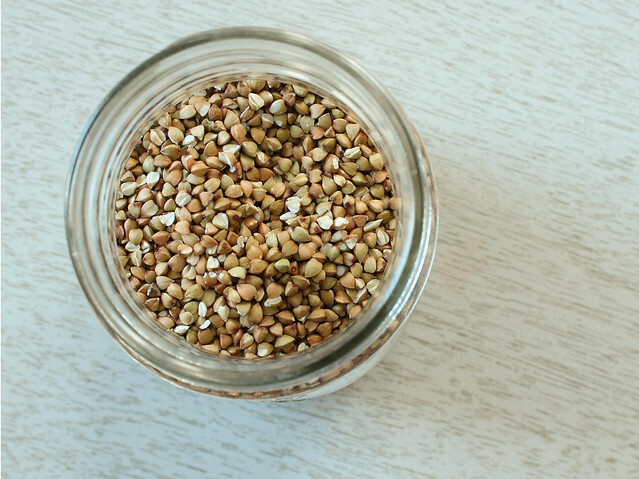 I really like alternative grains - or in the case of this buckwheat heavy recipe, alternative seeds. I've always loved the flavor of buckwheat flour, and I ground my own from bulk buckwheat I had kicking around in the pantry. Buckwheat is among the prettiest seed too, the tiny triangular things pop between the teeth when eaten raw or toasted. I prefer this sensation even more when I've sprouted and dehydrated it first. Then, it's a foolproof addition to granola as Marisa McClellan brilliantly noted in her first book. I grind most of my nut flours and whole grain flours in my Vitamix, which works so long as you are careful not to turn the oilier of them into nut or seed butters. (I measure by weight into the dry container and then blend.) This recipe called for almond flour, which I mixed up after the buckwheat was already turned to flour. It helped the almonds become more flourlike, while preventing them from becoming butter. Of course, you can use already ground buckwheat and almond flours. I mixed this up by weights, check out the original recipe for approximate volumes. Preheat the oven to 300 degrees. Line a baking sheet with parchment. Mix buckwheat flour, cornstarch, almond flour, cocoa, baking powder and salt. Cream the butter, sugar, and orange zest for 2 minutes on medium speed. (Scrape down the sides of the bowl and the beater with a spatula.) Add the eggs and vanilla, and beat together for 1 to 2 minutes, until well blended. Scrape down the sides of the bowl and the beater. Add the flour mixture and beat at low speed until well blended. (The batter will be very sticky.) Add the slivered almonds and mix at low speed until evenly distributed through the dough. Divide the dough into 2 equal pieces, and shape them into wide, flat logs, about 10 inches long by 3 inches wide by 3/4 inch high. Use wet hands to do this, and make sure they are at least 2 inches apart on the baking sheet. Place in the oven on the middle rack and bake 40 to 45 minutes, until dry, beginning to crack in the middle, and firm. Remove from the oven and allow to cool for 20 minutes or longer. Place the logs on a cutting board and use a serrated knife to cut them on a diagonal into 1/2-inch thick slices. 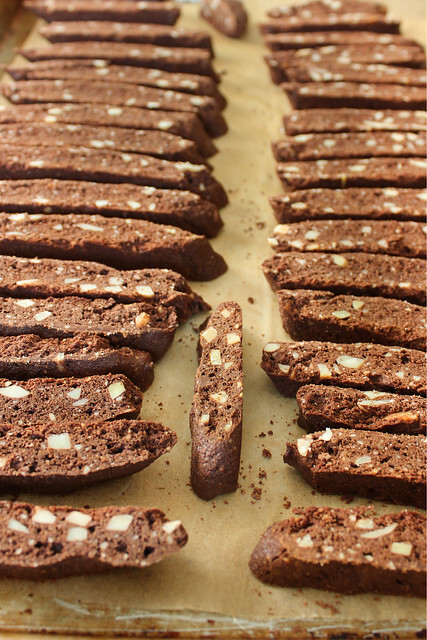 (They are more brittle than traditional biscotti, so cut carefully.) Place on a parchment-covered baking sheet and bake again in the middle of the oven until the slices are dry, 30 to 35 minutes. Remove from the oven and allow to cool completely before storing in an airtight container. You'd never know these were absent of gluten. They have a pleasant crunch and aren't as brittle-tough as some biscotti, so they don't require a dunk to soften them enough to be palatable. The orange is subtle, as (surprisingly) are the almonds. It's a very nice dark chocolate biscotti, that I've considered storing down on the basement pantry shelf to further improve my exercising and restraint.